It's been raining here in Sydney for over a week. In addition, our little one was sick for most of that week- so our days all turned into one long, dark and rainy day. To kill the time and keep Siena happy we did all sorts of crafty/fun projects and they kept both her and us entertained. We cooked, baked gingerbread cookies, decorated them with an odd green (the only food coloring I had) brown sugar (the only sugar I had) icing, we made a tent out of some old Ikea sheets, and an Ikea chalkboard (yup, chalkboard) and I spent time doing some free-lance crocheting of pants. 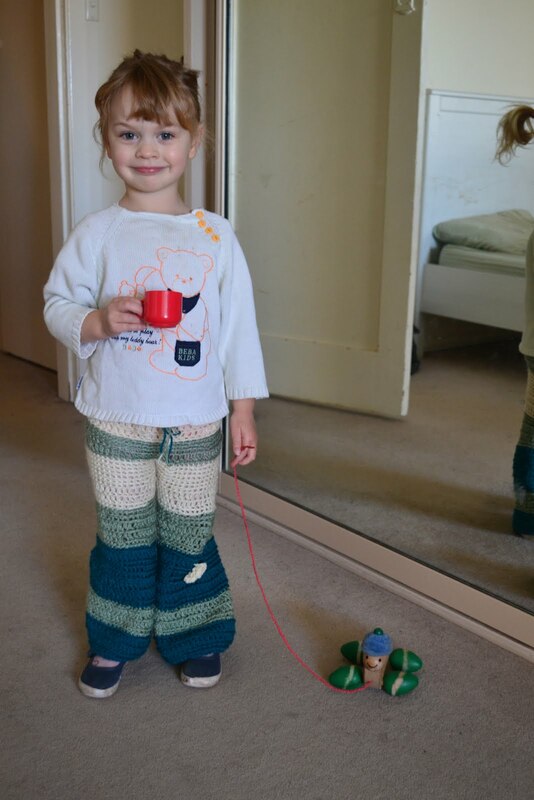 The crochet pants are just like all of my crocheting- no rules, just pure chaos- but she likes them and I like them so woopty-doo!